Visit SDSU's "Be International" website, a campus clearinghouse for all international opportunties! SDSU's International Student Center (ISC) works with international students who are required to pursue internships in their chosen major in accordance with U.S. federal regulation. In recent years, student demand for internships has increased. The ISC added a trainee program to its regulatory services to help meet this demand through internships within an academic department. The ISC also provides students in the international business major the opportunity to work at the ISC planning events in an intercultural context. View the continuing documentary of the San Diego State Study Abroad to Tanzania trip, picking up the action as the group enters the school grounds of the Kongwa school. See the YouTube video. International student enrollment has almost doubled during the past decade, from about 1,000 students to almost 1,900 in 2010. 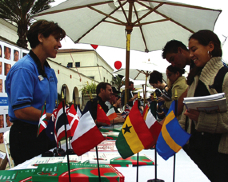 SDSU’s International Student Center supports students coming from more than 100 countries and speaking more than 60 languages. The number of SDSU students studying abroad continues to grow. Over the past decade, more than 10,000 SDSU students have studied abroad. SDSU ranks among the top universities of its type nationwide and in California for students studying abroad as part of their college experience. For 3 years in a row, SDSU has been nationally ranked No. 2 in its classification for its study abroad program. In 2010, the 53rd annual International Peace Village was held by the International Student Center in collaboration with the Associated Students. This international diversity festival allows international students to share their culture with more than 1,100 participants through cultural displays, music, song, dance, costumes and performance. The Office of Financial Aid and Scholarships provided over $2.2 million in financial assistance for study abroad during the 2010/2011 academic year. Of that, $510,000 was in the form of study-abroach scholarships. Global Pathways provides on-campus living options for international students and local students interested in global affairs, creating a cross-cultural community. Jobs here and abroad: Visit the Career Services site to find help for international students looking to work in the U.S., and for American students wanting to highlight international experiences to potential employers. Student Health Services provides a Travel Medicine Clinic to current SDSU students who are prospective education abroad students. The Office of Financial Aid and Scholarships, in conjunction with IT consultants in the International Student Center, have developed a web-based Study Abroad Risk Management System. The system quickly identifies students studying abroad who are affected by disasters, and gives the university the ability to quickly locate and contact students following a disaster. They are able to determine each student's individual status and to maintain communication in the critical days following a disaster. 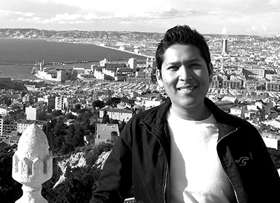 SDSU's Cultural Competency Certificate Program is the first of its kind in the CSU system. It offers cultural diversity workshops, seminars, and service learning opportunities to all members of the SDSU community. Upon completion, students are awarded a Certificate in Cultural Competency along with a stole that may be worn with their regalia at graduation ceremonies. Learn more about Diversity at SDSU! Student Affairs programs and services help provide international experiences for our students, acclimate and educate students from other nations, and educate students on cultural differences and competencies. Learn more about how Student Affairs supports diversity and cultural awareness. View YouTube video of international students talking about life at SDSU. Follow SDSU Study Abroad on Twitter! Visit SDSU's Study Abroad Facebook page! Both Counseling & Psychological Services and Student Health Services have partnered with SDSU's American Language Institute (ALI) so that international students in the ALI program may receive counseling and health care services. ALI students serve as a powerful pipeline to the university for future international students. Note that this list is not exhaustive. Academic departments, divisions, programs, and other SDSU organizations may offer international opportunities that are not listed here.